Transferring a RADAR project to another system is easy, and there are many methods to choose from. 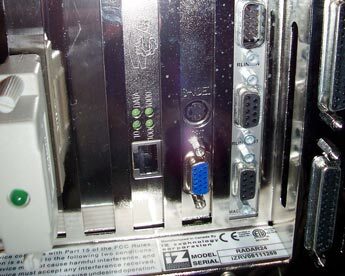 Other hard disk recorders record to proprietary file systems and take forever to transfer (for example, an Alesis HD24's 10BaseT ethernet takes at least four times the recorded time to transfer 24 tracks). RADAR records directly to industry-standard Broadcast WAV audio files (v 3.35/Jan 2005 and higher). Here are a few ways to quickly transfer those BWAVs from RADAR's hard drives to Pro Tools or any other Digital Audio Workstation (DAW). Methods C and D below refer to a Mac OS X system; For PC networking, see this document. A new eSATA port can be installed in the front of your RADAR, or a USB 2.0 port can be added to the back. (Silent Way's RADARs are equipped with the USB port on the back.) You can then record directly onto that drive. And, use RADAR's dual disk mode (only on Adrenaline Plus RADARs) to record simultaneously to an external drive and an internal RADAR SATA drive for instant backup. Unplug the external drive and hand it off. You're done! Contact iZ to get the eSATA or USB port installed in your RADAR. Note that RADARs with two SATA drive bays will lose the use of one bay if the front eSATA port is installed. The USB 2.0 port in the back does not steal a drive bay. Read more about the awesome eSATA (External SATA, or External Serial Advanced Technology Attachment) here and compare speeds of eSATA and other peripheral transfer technologies here. RADAR uses SATA drives (or SCSI in older units) in removable DE110 carriers, which can be mounted in an appropriate carrier receiver bay. 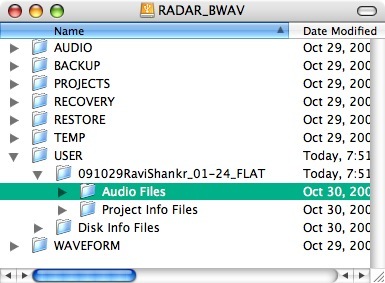 RADAR's "Project Flattening" makes the hard drive (and BWAV audio) readable by any Mac/PC/Linux. The RADAR drive must have been initialized as "AUDIO:RADAR_BWAV" before recording. Flattening and the AUDIO:RADAR_BWAV format were introduced in software version 3.35. Go to FILE menu / FLATTEN PROJECT and follow the steps there. Flattening should not take more than 10-15 seconds. For multiple-RADAR recordings (25+ tracks), do this for each RADAR. 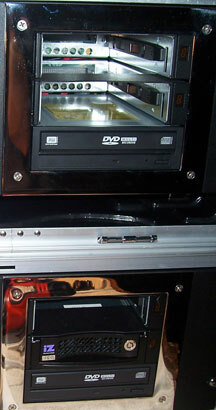 When it is finished, unmount the drive (DRIVE menu / MOUNT/UNMOUNT). Connect the MoveDock's power adapter to wall AC, and the MoveDock's eSATA (or USB) cable to your computer. Unlock and remove the drive from RADAR's drive bay and plug it into the MoveDock. Power on the MoveDock. The drive will show up on your computer's desktop as "RADAR_BWAV". Locate the flattened audio files, which are in the RADAR_BWAV/USER folder, NOT the RADAR_BWAV/AUDIO directory (which contains lots of small files). See a screenshot to the right. Copy these files to another drive but do NOT make any changes whatsoever to the RADAR_BWAV drive (critical!). After the copy is done, eject the RADAR_BWAV drive. Note that the new files you've created on your drive are locked. To unlock (Mac): select all files, press command-option-I, and uncheck "locked". For more than one RADAR (25+ tracks), you'll need to do these steps on each machine. Press "S" to "solo" control a different RADAR than the first. Follow the steps above, then press "L" to return to "link" mode. It is critical to note that if you make any changes to a RADAR drive when it is mounted on your computer, you will actually LOSE data! Just copy the files off and eject the drive. More details on Project Flattening are on page 88-89 of the 3.40 pdf manual (p 80-81 of the printed version). The fastest method is to use eSATA, which is many times faster than USB 2.0 when configured correctly. Your computer will need an eSATA port or an eSATA add-on card such as the U3esata USB3-to-eSATA adapter by DATOptic or the Apiotek Extreme Dual eSATAII Express Card Adapter. Also note that using multiple eSATA cables/adapters connected in series will decrease your transfer speed compared to a single long eSATA cable. The CRU-DataPort MoveDock DE110 uses an (L-shaped) "internal SATA" connector, so you'll need an "internal SATA"-to-eSATA cable. Without the MoveDock, the main drawback to this method is price. RADAR's drives are significantly more expensive than other external drives, and must be purchased directly from iZ or a dealer. Unless you buy a new drive for every project, are working in-house, or can get the RADAR drive back easily, it's better to transfer to another drive. Also, a project transferred this way can't be reloaded back into RADAR without extra steps (bouncing, transferring, and importing). This won't affect you if it's a one-way handoff. For example, a RADAR live recording that will be mixed in Pro Tools. If you need to return to RADAR, use one of the methods below. These are instructions for backing up a RADAR project to an external hard drive connected to a Mac. For PC networking, see this document. This method uses RADAR's FTP client to connect to Mac OS X's built-in FTP server over Ethernet. This description is long, but only certain sections will apply to your situation, and some steps are only needed the first time you use this method. Instructions may vary slightly depending upon your version of OS X. RADAR's FTP Client is only available in RADAR software versions 3.38 and up (including all Silent Way RADARs). Recent RADARs have Gigabit Ethernet aka 1000baseT (older models have 100baseT). • You should have an external hard drive connected to your Mac. This is a better option than using your Mac's internal drive. • Your Mac needs an ethernet port or ethernet adapter. The faster Gigabit Ethernet (aka 1000baseT) is preferred over 100baseT. Don't bother with 10baseT. • You'll need a Cat6 or Cat5e ethernet cable. Cat5 (the older version of Cat5e) will work for short lengths. For new installs buy Cat6. If you don't have a Mac with an autosensing jack (those with Gigabit Ethernet do), you'll also need the cable to be a crossover cable. • You'll need your Mac's user account name and password. • It's a good idea to name your tracks before transferring, as this info can be included in the filename. It's OK to name tracks during or after recording. 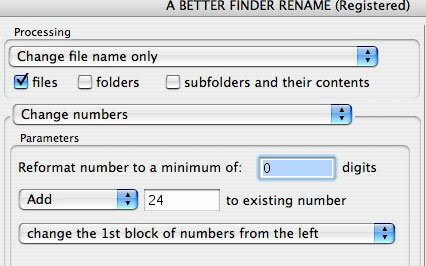 See Tip #2 below about file name format. • Understand the difference between a "server" and a "client" (client requests data from a server). Open System Preferences and then click on Network. At the "Show" menu, select Built in Ethernet and select the TCP/IP Tab. At the "Configure IPv4" menu, select "Using DHCP with Manual Address". At "IP Address" enter an IP Address. For example, Silent Way's RADARs are preconfigured to look for 192.168.0.7. At the bottom of the window, click the Apply Now button. Click on the Services Tab. Then check the FTP Access checkbox. It should then show "FTP Access ON" to the right, and should show FTP connection details. Check the File Sharing checkbox. Then click the "options" button. In the pop-up window, check "Share files and folders using FTP." It should show FTP connection details. Click on the Firewall tab. If the Firewall is on, click the "Stop" button to turn it off. (I'm investigating if opening ports 9000-9999 is sufficient.) NOTE: It's important to turn the Firewall back on when you're finished the transfer, to protect you later. Connect an Ethernet cable between your RADAR and your Mac. The RADAR Ethernet port is just to the left of the monitor port. Note the indicator lights next to the jack which tell you the type/speed of connection (1000/100/10). Connect your hard drive to the Mac via FireWire or USB 2. Power the drive on and it should mount on your desktop. Use RADAR's MENU/PREV keys, arrow keys and ENTER key to go to MAIN/PREFERENCES MENU/NETWORK PREFS/SERVER PREFS and hit ENTER. At the "SERVER PREFS: NETWORK PROTOCOL" prompt, just press ENTER. At the NETWORK PROTOCOL: prompt, move the cursor to FTP and press ENTER. At the SERVER IP ADDR: prompt, use the keyboard and arrow keys to enter the Mac's IP address (ie 192.168.0.7) and hit ENTER. At the SAVE CHANGES: prompt, choose YES and hit ENTER. Press RADAR's BACKUP button (on the Session Controller it's at the top/left, under "Macro 1"; on the KC-24 it's right of "L"). It will take a few seconds scanning. At the "USER NAME:" prompt, use the RADAR keyboard to type your Mac login user name (case sensitive), and hit "ENTER". At the "USER PASSWORD:" prompt, use the keyboard to type your Mac login password (case sensitive), and hit "ENTER". At the "SELECT FOLDER: <root directory>" prompt, press the letter "V". The display will read "Volumes/". Press the "+" key. This directory contains all external drives attached to the Mac. Navigate your external drive, using the "+" key to go down into a folder, and the "-" key to go up a level. Use the up-and-down arrows to navigate within a folder (hit any letter to jump to the first name with that letter). When you've reached the folder, hit ENTER. At the "BACKUP TYPE:" prompt, choose "BWAV (NO UNDO)" and hit ENTER. At the "TIME RANGE:" prompt, choose "All" and hit ENTER. At the "FILL SILENCE" prompt, choose "No" and hit ENTER. (Or, you may choose to fill the front/gaps/back if you don't already have contiguous audio tracks. 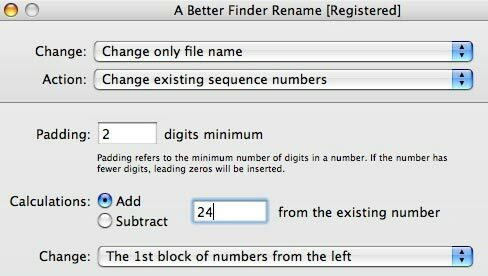 At the "BACKUP NAME:" prompt, type a name (or leave the current name), and hit ENTER. RADAR will display "xxGB REQUIRED. PROCEED? NO/YES". If you have enough space on your drive, select "YES" and hit ENTER. RADAR will show a countdown of the time remaining, and report when it is done. After the first time, some of the above steps will be skipped, such as login/password. The FTP USER NAME is My Account's Short Name. The FTP USER PASSWORD is My Account's Password. Another method is to use an OS X FTP app. For PC networking, see this document. The audio is transferring in the same direction as Method C (RADAR-->Mac), but is initiated via an OS X application rather than RADAR's FTP interface. This is limited and more difficult than Method C for a few reasons. First, you can't just pull the audio off of RADAR without performing some prep steps on RADAR first. You'll need to backup to RADAR's internal D:Archive drive before accessing that backup via an OS X FTP client. Also, OS X does not come with a FTP client app. Great third-party Mac FTP apps are available: the $30 Transmit by Panic, free FileZilla, free Classic FTP or free Fire FTP Firefox plugin. Use the MENU/PREV, arrow keys and ENTER key to go to MAIN/PREFERENCES MENU/NETWORK PREFS/INTERFACE PREFS and hit ENTER. Select HOST NAME. At the HOST NAME: prompt, enter a name for your RADAR and hit ENTER. At the DHCP SERVER: prompt, choose DISABLED and hit ENTER. At the LOCAL IP ADDRESS: prompt, use the keypad and arrow keys to enter an IP address (ie 192.168.0.8) and hit ENTER. At the SUBNET MASK: prompt, use the keypad and arrow keys to enter a subnet mask value of 255.255.255.0 and hit ENTER. At the GATEWAY: prompt, leave blank and hit ENTER. At the PRIMARY DNS: prompt, leave blank and hit ENTER. At the SECONDARY DNS: prompt, leave blank and hit ENTER. At the FTP SERVER: prompt, select ENABLED and hit ENTER. At the FTP LOGIN NAME: prompt, type "radar" and hit ENTER. At the FTP PASSWORD: prompt, enter a password of your choosing. Backup your project to the D:Archive drive, following "Backing up projects via FTP" (above) steps 1-12, except you'll choose the D:Archive drive rather than N:Mac. Connect all cables as in Method C (above). Launch OS X FTP app. Using the OS X FTP app, login to RADAR using username "radar" and the password you chose above. Navigate to the backed up project on the D:Archive drive. Copy project files to your Mac's external drive. In "Music Editing for TV and Film in Pro Tools," see "Importing audio files" in Chapter 1. In "Audio for Film and Video with Pro Tools," watch "Importing and the DigiBase browser" in chapter 3, and also turn on "original/user time stamp" in the Digibase view menu. When backing up or exporting, RADAR creates filenames on the fly. This means that you have complete control over what info is included in filenames, even after recording. Change this setting at this menu: PREFERENCES/FILE PREFS/FILE NAME FORMAT. My favorite is "TRK-REGION-NAME" (i.e. track number - take number - instrument name). This creates files such as T01-0001-Kick.WAV, T02-0001-Snare.WAV etc. When you've got a 48-track (or more) RADAR system, backing up is the same as always, except that you need to do each RADAR (24 tracks) separately. When two or more RADARs are linked, the backup from the extra machines automatically names the audio files according to their track number. For further reference, see izcorp.com.